The holiday season is approaching, filled with parties, family and, for many of us, a few extra pounds. If you stand on the bathroom scale January 1 and see a higher number, you may resolve to take off those pounds ─ fast. If that’s the case, be careful how you do it. There are fad diets on the market that promise quick weight loss, but many of them take an unbalanced approach to diet and nutrition. Some tell you to avoid “bad” foods, such as carbohydrates or fats, while others restrict you to just a few foods. Any diet that restricts certain foods or strictly limits calories can lead to initial weight loss. But fad diets rarely bring long-term results because people return to their poor eating habits when the diet ends. Also, people who use these extreme diets may not be getting all the nutrients they need to stay healthy. Let’s examine five fad diets to avoid in 2017. Then we’ll give you tips for the right way to control your weight during the holidays. The Five-Bite Diet encourages you to count bites instead of calories. You skip breakfast and then eat five bites of whatever food you want at lunch and dinner. The problem with this approach: even if you choose high-calorie foods for your five bites, you may only take in about 800 calories a day, which is less than half of the recommended daily amount. This diet won’t provide you with the key vitamins, minerals and nutrients your body needs, and may cause deficiencies that lead to anemia, bone loss, decreased cognitive function, and low energy. The Raw Food Diet teaches that cooking food destroys nutrients and natural enzymes, so you should only eat raw fruits, vegetables and grains. Since raw foods are often low in calories and fat, you’ll probably lose weight and get some nutrients on this diet. The downside is you’ll also miss some important nutrients, including protein, iron, calcium and minerals. Also, cooking food has some benefits, such as killing bacteria and making food easier to digest. Eating only raw foods can also lead to bloating, indigestion, constipation, malnutrition and a lowered immune system. The Baby Food Diet is an Internet phenomenon that cuts calories and controls portions by having you replace one or two meals a day with baby food, which ranges 25-75 calories per jar, and then eat a healthy dinner. This diet has several notable drawbacks. It is very low in fiber, which can lead to digestion problems. It is low in fat and protein, which will leave you hungry in an hour or two and increase your chances of binge eating. Also, since baby food is very bland and there’s little chewing, you will probably feel unsatisfied and crave something else. The Blood Type Diet is based on the assumption that the foods you eat react with your blood type, so your blood type dictates what you should eat. If your blood type is A, for example, you should have a mainly vegetarian diet; type O’s should consume meats and avoid grains; type B’s can eat a variety of foods; and if you’re type AB you can eat anything on the A and B lists. But research has not supported this diet’s claims, and following it can deprive you of vital nutrients. For example, people with type A blood may not get the proteins and carbohydrates they need for good health. Master Cleanse claims to rid the body of harmful “toxins” and promote weight loss. It is a liquid diet that lasts three to 10 days and features a special lemonade drink made of lemon juice, maple syrup and cayenne pepper. This concoction is a diuretic that will cause you to shed water weight. The problems with the Master Cleanse are shared by all “cleansing” regimens. First, its claim that it rids the body of toxins is questionable since your liver and kidneys do that on a continual basis. Second, once you stop the diet, the water weight will return. Third, the diet only gives you 600-1,200 calories a day, well below the recommended daily amount. And finally, because of the lack of nutrients and calories, you may experience fatigue, nausea, dizziness and dehydration. Be realistic. Instead of trying to lose pounds during the holidays, try to maintain your current weight. Plan time for exercise. A moderate increase in exercise can help offset holiday eating. Try walking briskly 10-15 minutes twice a day. Before a party, eat a light snack like raw vegetables or a piece of fruit to curb your appetite. At a party buffet, take small portions of a variety of foods, including vegetables and fruits. Eat until you are satisfied, not stuffed. Chew your food slowly and enjoy the flavor. Limit the amount of alcoholic beverages you drink. They can lessen your inhibitions and induce overeating. 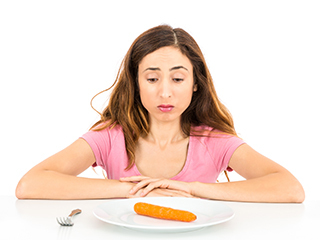 If you overeat at one meal, eat less at the next to balance out your calorie intake. Plan group activities with family and friends that aren’t all about food. Try playing games or going on a walking tour of decorated homes. Prepare favorite dishes that are lower in fat and calories. Here are some tasty, healthy holiday recipes to get you started. Dr. Janice Rutkowski is an MPCP partner and is certified by the American Board of Internal Medicine. She sees patients at the Arundel Mills office.